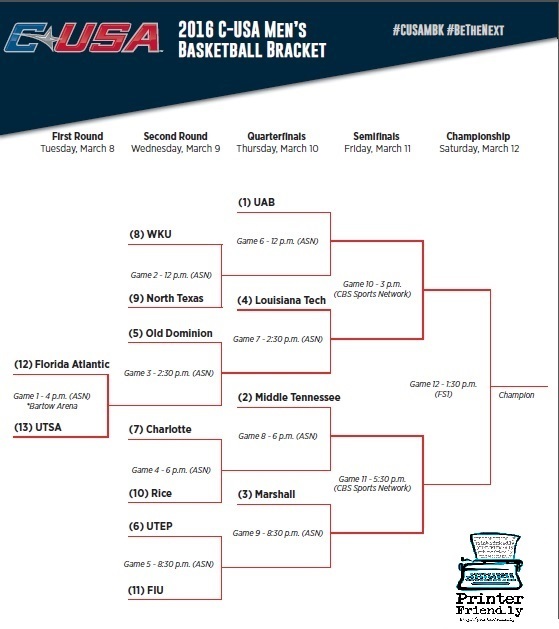 It’s time to get your printable 2016 Conference USA Men’s Basketball Tournament Bracket. Tournament play kicks off on March 8th, 2016 this season. All of the postseason action for the tourney will take place in Birmingham, Alabama at the Legacy Arena. All teams with the exception of Southern Mississippi will be taking part in the tournament this year. Southern Miss is serving a self-imposed ban on postseason play this year. The overall #1 seed for the tournament is UAB followed by Middle Tennessee as the overall #2 seed. The 2016 Conference USA tournament schedule has been finalized. We have published a free, printable version of the 2016 tournament bracket for you to enjoy. We also have a blank, 2016 NCAA Tournament Bracket for you to download and use to help follow your own bracketology this postseason.